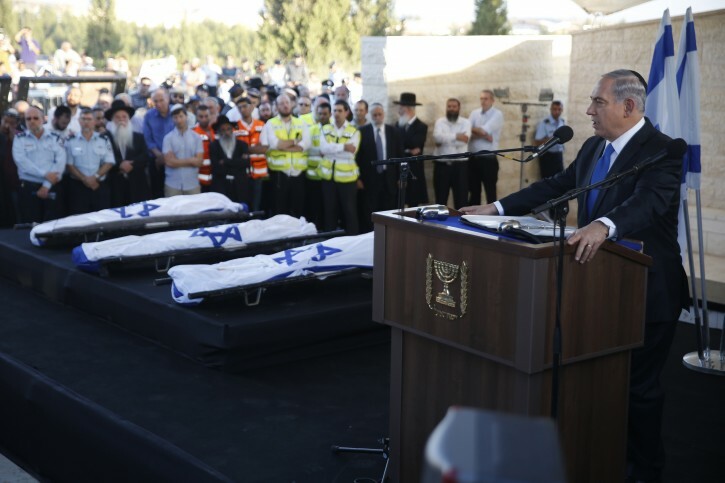 Netanyahu, speaking alongside Defense Ministry Moshe Ya’alon and Chief of General Staff Lt.-Gen. Benny Gantz at the Defense Ministry in Tel Aviv before convening a security cabinet meeting, said that anyone harboring the illusion that they will achieve anything through terrorism will be disappointed. Netanyahu laid out three goals of the continued military operation. The first, he said, was to apprehend the killers and anyone who participated in their kidnapping and murders. The third goal, he said, is to act against Hamas in Gaza. How about undoing the biggest mistake Israel ever made? Just take back Gaza!!! Bibi should stop announcing anything, does everyone have to know he wants to build buildings, or expand things, or attack things. What other country needs to announce they are going to build a building in a part of their own country, but Israel, is he waiting for a permission slip. Agree with no. 1. Time to undo arik Sharon's major blunder in 2005. Time to completely obliterate Hamas and take back Gaza... Too bad that he didn't live to see the churban (destruction) that he created!!!!!! Indirectly , Natanyahu has a small share in the problems with the Arabs in the Chevron area. Wasn't it Natanyahu (during his first term as PM) who gave that area to the Arabs in Jan. 1978? I was at the vosikin minyan in the Meoras Hamachpeiloh on the last day before his gov. gave that area away (I believe it was Jan. 15 , 1978). As soon as their homes are destroyed the PA gives them the millions in u.s. aid to build a new home with new appliances. Then the terrorist families a rewarded with a monthly stipend. They go out and buy new cars, clothing and all the best. We must cut off the head of the snake. Stop the flowing of our taxes to support the palestinian and hamas animals. To #6- You are sadly misinformed. Netanyahu wasn't even in the government in 1978. Menachem Begin was Prime Minister at the time.